Sand dressed surfaces combine the advantages of sand filled and waterbased systems. The thin sand layer is installed to the base of the carpet to add stability and support the fibres, but essentially leaves the playing surface unobscured for consistent hockey ball roll and improved playing characteristics. Our surfaces are FIH approved for National and International competitions, except for the final stages of competitions such as World Championships and Olympic events. 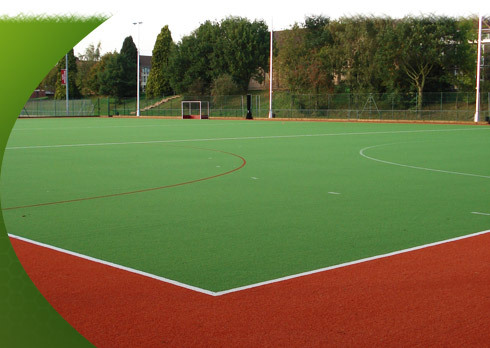 Sand dressed surfaces are suitable for hockey, football, tennis and most other sports to a recreational level. We offer a comprehensive range of shockpads to complement our range of carpets and help produce the exact performance criteria you require for your facility. The shockpads are designed to support multi-sport use without compromising the primary sport and to comply fully with the performance requirements of the relevant governing body. Our standard base specification is 300mm consolidated depth of suitable granular material with two layers of open textured tarmacadam. However the civil engineering element of the facility will be designed for you, having considered all the site characteristics.